Florida, a state I really CAN get too much of, offers its exciting take on the relatively unexciting sport (I resisted the urge to put quotes around that, I'm saving them for a NASCAR story). A Venice, Florida man was looking for his ball in a golf course pond when he almost found his maker instead. 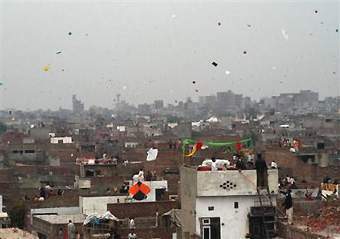 Pakistan's Supreme Court has extended a ban on making, selling and flying kites that it imposed two months ago after ruling the sport had become increasingly deadly, an official said Saturday. At an annual kite-flying festival in February, 19 people were killed and over 200 were injured. While the court was hearing the case, police swung batons and lobbed tear gas shells outside the building to disperse about 500 kite-makers and kite-flying enthusiasts who were trying to attend the proceedings.